Shake all daubers thoroughly. Take off Dauber top of Sunburst. Stir bottom of container to mix mica and color thoroughly. 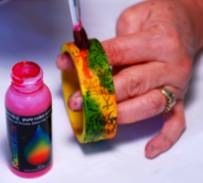 Using a paint brush, dip into container and paint the interior surface of Bracelet. Lay placemats down and put bracelet in front of you. Ink Stamp with Stazon Ink. Stamp has to be laying flat and rubber side up. 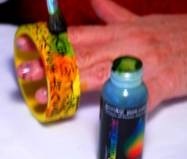 Roll bracelet across ink up image. Re-ink and line up with section of bangle that is not stamped. Continue to roll until Bangle is covered. Heat set with heat gun. 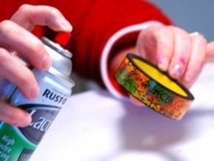 Take Dauber top off of Mediterranean Blue. Dab some of the paint off as above. Then, feather the Blue into the yellow/orange until the bracelet is blended. The Blue will blend until green in color. Take Dauber top off of Pink Azalea. Dab paint brush as above. Feather paint into the other colors. Set bangle with heat gun. Take the black pen and finish the edges. Seal with Enviro-Tech epoxy sealant. Follow instructions, mixing 2 TBSP of mixture. Apply with a throw away brush. Allow to ‘hang’ from dowels, and dry completely for 72 hours. 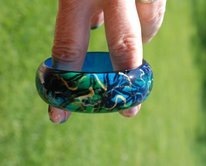 This gives a glossier, stronger finish to the bangle.